The fact that print is declining as a medium for journalism, and that newspapers are going to have to deal with that in a variety of ways, was brought home with a thud recently when Advance Publications and Postmedia announced they would no longer print some of their papers on certain days, in order to save money. In the case of the New Orleans Times-Picayune, the loss of the printed version of the paper three days a week has been criticized as almost a dereliction of public duty by the paper’s owner — as though something digital doesn’t have as much force as the printed version. As more newspapers are forced to make similar decisions, what impact will that have on their ability to serve a public purpose as an information source about the community? The constancy of a daily paper — in the rack at the convenience store on Frenchman Street or on the tables of the coffeehouse on Maple Street — is a reminder to a city that someone is out there watching… You have to wonder whether it will still have the same impact when it doesn’t land day after day on doorsteps all over the city. Does being digital rob a newspaper of some of its power? In a discussion with Carr and others on Twitter after his story appeared, I argued that there is no reason (theoretically at least) why a digital-only organization couldn’t be just as much of a watchdog, and serve the community as well or better than a printed newspaper. Carr noted that many New Orleans residents don’t have internet access, and I countered that many residents likely don’t subscribe to the newspaper either — but he maintained there is a value to papers that are handed around or read in coffee shops that the web can’t duplicate. Some of this is tied to the brand that a newspaper has, and the established history of covering a community. What happens to that when it stops printing on certain days, or shuts down altogether? One thing that can happen — especially if cost cutting extends to staff who would have done investigative or enterprise stories — is that a paper can lose a lot of goodwill, which is difficult to regain. But it raises the question: what is the purpose of a newspaper, to make money or to serve a public purpose in society? And can a digital paper do both? Advance Publications, owned by the Newhouse family, shut down the printed newspaper in Ann Arbor, Michigan in 2009 and went with a digital-only version — and according to some, it has lost a lot of the strength it used to have as a community voice. Charles Eisendrath of the University of Michigan told the New York Times that he eventually stopped subscribing to the website. “Is AnnArbor.com discussed much in Ann Arbor? No. Is it an authority? No,” he said. That kind of decline for a brand is likely to translate into a loss of advertising as well, which then becomes a slippery slope of cuts leading to more cuts. This three-day-a-week stuff really kills you. You want people who look at you every day…Once people get used to online, I don’t think they come back. That’s the problem in a nutshell: once your newspaper has been stripped of the magic of print — the same magic that makes you far more appealing to advertisers than the amount of time spent with your medium would seem to indicate — you become just another digital voice among thousands or even millions of other voices. Then you are no different from the Huffington Post, or Buzzfeed, or a Twitter-driven news source such as News.me or Prismatic. In fact, you could actually be seen as worse in some ways, because you are a single voice. What is the solution to this problem? If, as newspaper consultant and digital-media veteran Dan Conover said recently, newspapers have to confront the problem of costs head-on — and stop printing if that is the only avenue that will work — then they must make both the print experience and the digital-only version as unique as possible, and focus on the elements that make those two different mediums powerful in their own right. Simply hoping that everyone will implement paywalls and return the information age to the days of print-based scarcity, as David Simon seems to be recommending, is not a long-term solution. The biggest issue for publishers like Advance is that doing this properly costs money, and if cost-cutting is their primary goal then investing in digital journalism may not seem like something worth doing. But the media companies that don’t do so will become just another voice in the crowd — and possibly not a very important one. Newspapers have to have their own dedicated tablets giving their own newsfeeds. The comment about LOCAL below is correct. 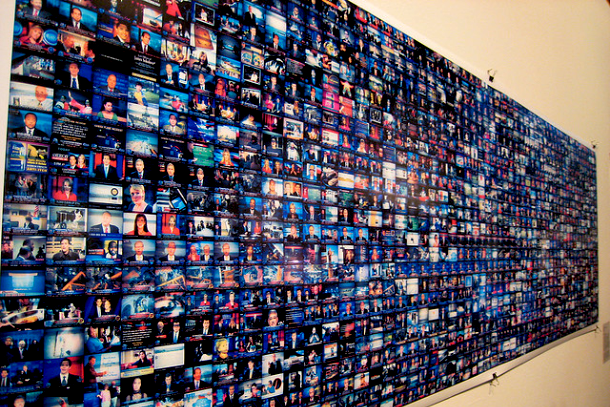 The web gives no local voice, though it could be said that’s news TV’s role now. Newspaper tablets could be kept in libraries (also a dying breed), cafes and even bookshops. True. Print has staying power and is a pleasure. New electronic paper may change things in the near future. For now, newspapers have to cluster together and sell cheap tablets wired specifically to their newsfeed and kept in public places like libraries or…even bookshops….cafes especially. The net has no unique LOCAL voice. Democracy is changing as is trade. Tablets were once the medium in ancient days and so are they now. The end of newspapers could one day be seen by historians as the start of a totalitarian dark age, however much we now argue that the web is democratizing. In a strange way at the moment in some ways it is more controlable. However, I have written this on an HTC smartphone. Buffett did not buy Media General. Berkshire Hathaway bought 63 newspapers owned by Media General. Media General will continue to exist as an owner of television stations and digital assets. Thanks for pointing that out, Matt — you are quite right. That was sloppy of me. I will fix. Print also has signalling value â€“ like the impressive buildings of banks. If someone has gone through the trouble to invest in printing and distribution infrastructure, they’re in it for the long term, and are not fly-by-night. So the voice of print gains more authority. The downside of the democratisation of information is that it makes it more difficult to pick out the signal from the noise and creates a diffusion of resources that also makes it more difficult for a single source to remain mostly signally rather than mostly noisy. I remember reading a quote from a Soviet-era standup comedian (one of the few media through which political criticism could be delivered if it were appropriately veiled) who said something along the lines of â€“ “when speech was expensive, a lot more effort was put into the selection of every word said”. Print news vs internet news has a similar effect. This does not mean that we should preserve print indefinitely, but we should investigate if there are any possible ways for signalling on the net. Continuity (or lack of it) certainly eats into their credibility and public trust (pun intended), but that’s just one of several contributing factors. I don’t think it’s the biggest one. The biggest one, to me, is the competition for attention from other options (many digital). That’s driving the need to rethink the economics of print. Print isn’t magic. It’s tactile. In that sense, it has some inherent advantage to be present in the community and have an impact. But the biggest impact is all those other voices fragmenting attention. Print (newspaper) was magical and powerful because it was the only show in town. Those new (digital) voices can be powerful watchdogs — if they want to be. If they find a model and aim to have that type of voice. I think you write a little more the other day about how AnnArbor.com did not have a business model (so to speak) that aimed to have that voice of authority in the market… and therefore, they don’t. I’m not sure I agree with you here. There is a very good reason. 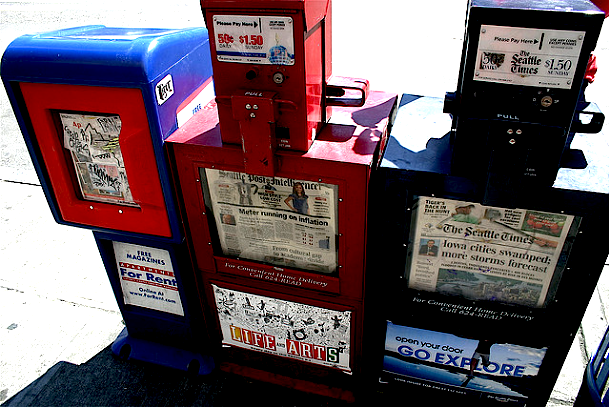 Newspapers are inherently local media because that’s how they are distributed. Web sites are immediately distributed everywhere. Therefore, it makes a lot more sense for a local newspaper to invest in reporters to cover city council meetings, etc. For web sites, you’re much better off spending on columnists and bloggers. I’m not saying that I have a solution, just that there is a problem and it’s a serious one. Thanks for the comment, Greg. That’s a fair point — but just because a website *can* be distributed everywhere doesn’t mean it has to be. There are lots of examples of community-focused websites that do a great job of covering their local news, with Howard Owens’ site being just one. I don’t think being digital and being local are mutually exclusive. Thanks, Mathew, and just to put a little more meat on the bone: 80 percent of our site traffic comes from our coverage area. Much of the rest comes from expats living out of the area. There just isn’t much we do that shows up in a stream or search that is of interest to people who don’t have some tie to our community. Not to overly press the point, but the issue isn’t that digital and local are mutually exclusive (you’re right, they’re not) or even, in reference to Howard below, that an audience online can’t be local. The issue is that the old model of locally sourced classified ads underwriting full-time journalists to cover multiple local beats and do investigative journalism doesn’t appear viable anymore. There are some mitigating factors, such as that digital technology makes some things easier, through interent searches, API’s, data journalism, crowdsourcing research and the like. However, the concern is valid and important.